One of the biggest obstacles to eating healthy is usually time. Many families in the UK sacrifice breakfast because they say they just don’t have time. Dutch kids are some of the happiest in the world and research has concluded that one of the reasons is because they have a family breakfast together. Now, I don’t want this blog post to come across as smug and righteous but I do believe that 1) kids need breakfast and 2) if you stick to a routine you can find time. Ironically, I hate routines but once you have kids you just have to start adopting them, otherwise nothing gets done. 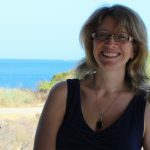 Getting six people ready in the mornings has become a bit of a military exercise in our house, so I thought I would share with you what we do. 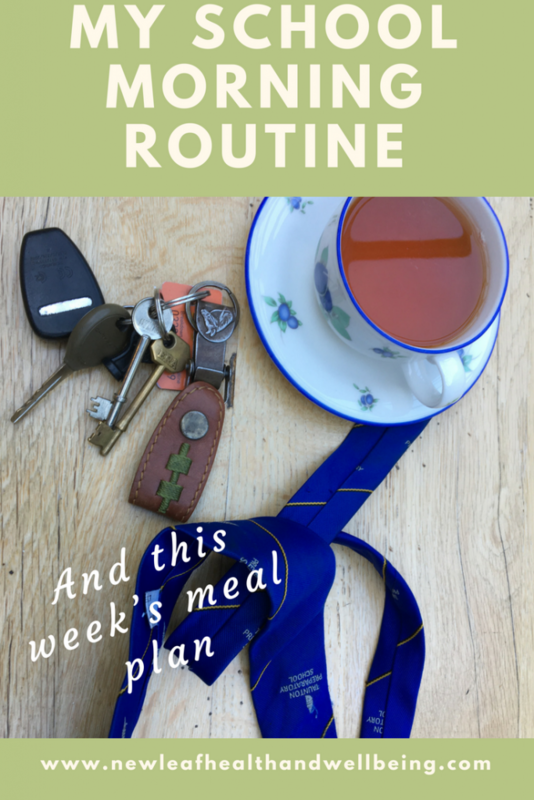 Hopefully our routine may help you work out a plan for your mornings. 6.10 am – We are lucky that usually only one of us has to leave the house to do the school run so that person hops in the shower. The other parent will then go downstairs to let the dog and cats out for a pee, give the dog breakfast, lay the table for breakfast, probably empty the dishwasher from the night before, make a cup of tea! 6.30 – 7.00 am – We enjoy a cup of tea in bed! If we both have to leave the house though, the other parent will jump in the shower during this time. 7.00 am – Wake the kids up and get their breakfast orders! Hubby and I then get breakfast ready. Mealtimes in our crazy house can often resemble a café with 6 different orders. Usually there are combinations of eggs (boiled/scrambled), toast, fruit, yogurt, granola, cereal and COFFEE!!! We usually eat breakfast together around 7.15/7.20am, assuming the kids have fallen out of bed. 7.30 am The two younger kids get dressed into their school uniform. I pack their school lunches, school bags and games bags ready to leave. (I usually prepare their packed lunch and sort out their uniform and PE stuff the night before). 7.40am Everyone’s in the car and off to school! Once everyone’s gone this gives the remaining parent time to tidy up breakfast and maybe sneak in some exercise! Obviously our routine probably won’t work for you but once you find one that fits your lifestyle it does make life easier in the mornings. Some other tips that might work for your routine: lay the breakfast table the night before, prepare a takeaway breakfast to eat on your commute or when you get to work. Getting teenage kids to eat breakfast is usually impossible so I try to provide them with some snacks to take with them to eat at break-time, which is when they’ve usually woken up sufficiently enough to feel hungry. I hope you find this insight into our routine helpful. Do you already have a morning routine that incorporates breakfast? I’d love to know what your routine is – tell me in the comments below, on Facebook or on Instagram. Paprika pork steaks, Portobello mushrooms, sweet potato wedges and pineapple coleslaw. I hope you have a super week. Why not sign up to the New Leaf Newsletter here to get regular updates, recipes and articles. Are you intrigued? 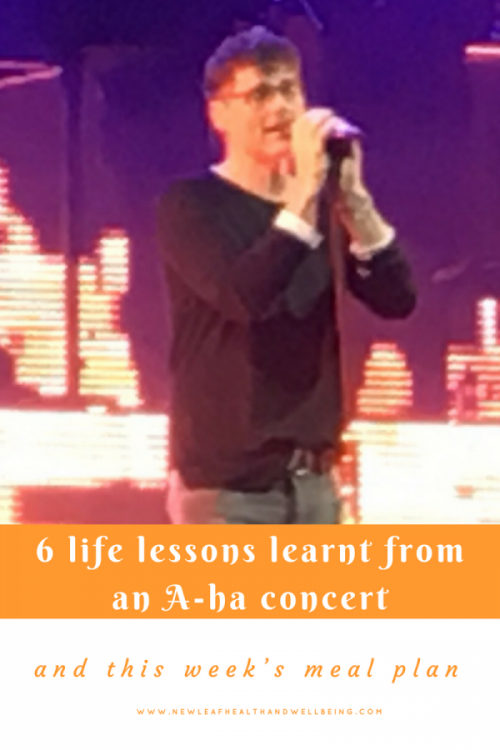 What life lessons could I possibly learn from an A-ha concert? It’s important to be present in the moment. It’s easy to get distracted taking photos and/or videos when you’re experiencing an event. Yes, photos are a great reminder of an event, but if you’re not careful you can end up spending all of your time viewing life through a small screen, instead of taking in the wider sights and sounds. When I was travelling in my younger years I was always astounded by the tourists who would arrive at a beauty spot, jump out of their vehicles, take some photos and then leave again. In my experience you will gain so much more by stopping, sitting or standing, breathing deeply and taking in the atmosphere of a place or activity. Make time to really absorb what you are doing. With our busy, stressful lives it’s easy to forget to have fun. As a mum of four kids, days and evenings easily become swallowed up by chores – stuff that needs doing but isn’t fun at all. It’s easy to get stuck in a rut of just doing mundane stuff. Make time to book in some regular activities doing things you really enjoy! I know I need to work on this one a bit more! I’d forgotten how much joy music can bring. Seeing three bands from my youth brought back strong memories of my younger self. Whilst it’s good to move with the times and explore new music, playing music from your past reminds you of the things you used to enjoy. This will help with point 2 above so that you can find activities to reinvigorate your sense of fun. Music is also a powerful way to influence your mood. If you’re feeling low or need some motivation, then playing music that you associate with happy times can help boost and invigorate. Likewise, you could choose music that reflects your mood and how you feel. It’s okay sometimes to be quiet, reflective or a little sad – you don’t have to (and it’s usually not possible) to be happy all the time. Just be wary of staying in that mood for too long. I’m always struggling to fit enough exercise into my life and I know this is a common problem for most people. I also know how important exercise is as a preventive medicine. After seeing the band and in particular Morten Harket, who at age 58 looks fantastic, I’ve been motivated to try much harder to do more exercise. Eating healthy, exercising, not smoking or drinking can have amazing anti-aging effects! On a slightly darker note, I have a word of caution for ladies (and possibly men too). Be aware of others around you. We were standing throughout the concert in one area, as were most people. There were couples, groups of friends and families. Near us were two men who spent the whole evening getting drunk and chatting up any ladies who were there without men. They spent a considerable part of the evening chatting up two girls in particular. One girl went off to get drinks, leaving the other girl to keep their place. Shortly after, one of the men chatting them up disappeared as well. A good 20 minutes or so passed and I could see that the girl waiting was beginning to become concerned that her friend hadn’t returned. Eventually she did appear, drinks in hand, followed shortly after by the man. Now, most likely nothing happened but there was a risk that by splitting up the girls had made themselves vulnerable to a possible danger from these drunken men. Probably, the girls and men were just looking for some fun, but be careful not let the pursuit of fun impair your judgement of others. Life lesson No 6 – I’m getting old! Lastly, standing (and dancing) for five hours didn’t help the arthritis in my knees. Oh the joys of getting older, but I’m on a mission now to do more exercise with Morten as my muse! Don’t forget to sign up for my free Newsletter here to get regular updates, news and tips. As I’ve mentioned before, most supermarkets are set up intentionally to make you buy as much unhealthy food as possible. These foods are made from low grade ingredients that provide retailers with the greatest profit. 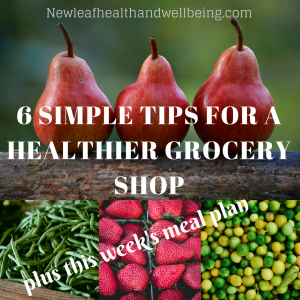 So here are my 6 simple tips to help make your grocery shop healthier. A shopping list works best if you’ve already planned the meals you’re going to cook. You can then ensure you include on your list all the ingredients you need for these meals. This method will help you save time and money. It will also help to stop you buying ‘ready meals’ and foods that distract you from your healthy eating goals. Keep your list somewhere handy in the kitchen so that you can add items to the list when you use something up. 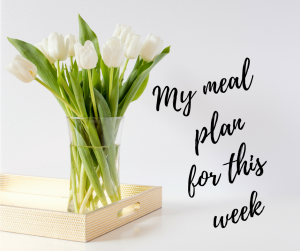 Check out these great shopping and meal planner pads to help keep you organised. If you’re starving then everything in the cake aisle will be screaming your name! When you shop with a full stomach, research shows you are much less likely to make poor food choices and you’ll buy less food overall. If you’re trying to eliminate certain foods from your life such as cakes, sweets and chocolate, then avoid these aisles. Willpower is a limited resource so if you are not near these items you won’t need to rely on your willpower to resist them. The same principle works in the home too – don’t have food items in your house that you are trying to avoid. If they are not accessible it’s a lot easier to avoid them. Seeing and smelling healthy fruit and vegetables will put you in the right mind-set to fill your trolley with good stuff. 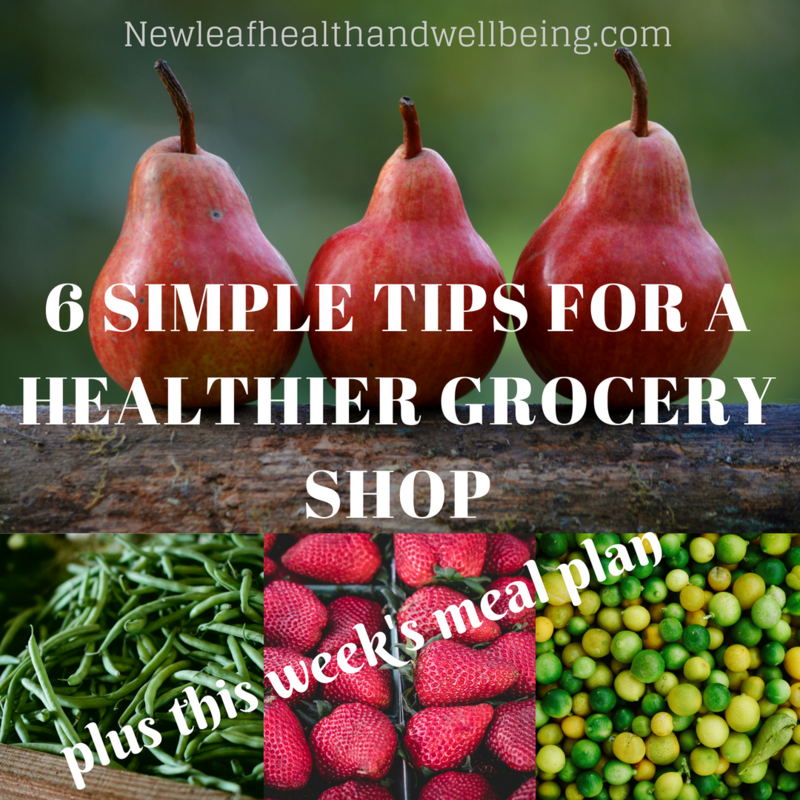 Then, when you carry on shopping you will be less tempted to pile in unhealthy foods. There will also be less room for unhealthy stuff!. Firstly, seasonable fruits and vegetables are much cheaper so you can load up with more. Plus, they are usually fresher which means they are more nutritious and better quality. The traffic light system on food packets in the UK is a helpful tool that displays calories, fats, sugars and salt levels, but not all food producers follow this system. This means that you have to carefully study the nutrition labels. It can be really time consuming and not always possible when you have children in tow. If you can’t check the labels whilst shopping, spend some time checking them when you are at home with more time. When I do this and realise a product isn’t as healthy as I thought, then I just make a mental note to not buy that item again. I hope you find these tips helpful. Let me know if you have any other helpful tips you’d like to share. Don’t forget to check out my Facebook page here or you can link up with me on Instagram here. At the weekend my 12 year old son wanted to go and watch the new Avengers Movie – Infinity War. I drew the short straw to go along as his adult supervision (it’s a 12A). I’m not really a Marvel/DC fan so it was a long three hours of my life! If you don’t want me to spoil the story line for Avengers Infinity War or Dan Brown’s Inferno then please skip the next paragraph. The basic outline of the story in the Avengers movie is that Thanos, the ‘badie’ thinks the only way to stop suffering and poverty in the universe is to randomly sacrifice half the population, so that the survivors will have a better life. He sets off on a quest to collect five magical crystals to give him the ultimate power to achieve his ends. Likewise in Dan Brown’s Inferno, the ‘badie’ devises a virus to randomly kill off half the population to achieve the same outcome. It’s safe to read this bit! If you start looking at the health statistics for the human population it’s hard not to feel we are already fighting an infinity war. Rates for obesity, Type II Diabetes, Alzheimers/Dementia and heart disease are all escalating at frightening levels. Increasingly, the root cause of these epidemics is linked to our food and lifestyle choices. Alzheimers and other dementias are now the leading cause of death in the UK. It’s the leading cause of death in women and the second cause of death in men. With an aging population, living longer does play a part in the higher levels of dementia and alzheimers but increasingly scientific research is discovering links between some forms of dementia and alzheimers to the food and lifestyles we live. This is the UK’s second biggest killer after dementia. It’s a disease that kills more than 1 in 4 people in the UK. Some forms of heart disease are congenital or genetic, but again many forms are directly linked to lifestyle choices. Risk factors for cardiovascular disease are high blood pressure, high blood cholesterol and diabetes. The lifestyle factors that contribute to CVD are smoking, being overweight or obese and being inactive. A recent Harvard Medical School study goes one step further and says that giving up meat could save up to 200,000 lives. Obesity increases rates of heart disease, stroke, high blood pressure, cancer and diabetes. People with a BMI of 30-35 have a reduced life expectancy of 3 years, and people with a BMI over 40, decrease their life expectancy by 10 years. Obesity claims over 30,000 deaths a year with 9,000 of those deaths in people before retirement age. The best ways to prevent obesity is to get more exercise and make changes to our diet. 2 out of 5 adults do not achieve the recommended levels of physical activity and only ¼ of adults and 1 in 6 children in England and Scotland consume the recommended minimum 5 portions of fruit and vegetables per days. In addition, around ¼ adults in the UK exceed the National guideline for weekly alcohol intake. More people than ever have type II diabetes and more people than ever are at risk of developing Type II diabetes. If the current rates don’t change it is estimated that more than 5 million people will have diabetes in the UK by 2025. 90% of the cases of diabetes are Type II diabetes which is linked to lifestyle choices. All of these conditions can bring about the randomised death of our friends and families in just the same way as the storylines in popular disaster movies. Human beings need to wake up to the fact that our health is being attacked every day by the choices we make. It’s said the average adult makes up to 200 food choices per day. Many of these choices are influenced by industrial food producers who have an arsenal of weapons to make us pick their foods – intensive marketing and products designed to trick our brains into craving them and becoming addicted to them. Whilst some may argue that the Government should step in and control the food industry more, the basic fact is that if we want to protect ourselves and our families we need to do much more to educate ourselves to make better choices. If you were a character fighting in a disaster movie, you would find out as much as you could about your enemy right? You would also want to find out your enemies’ weaknesses. With the food industry it’s their profits – stop buying the over processed foods, then they will have to change. However, I fully realise how over whelming the whole healthy eating movement can be and I also believe it’s impossible to jump straight into being super healthy. We have to train our bodies and minds to accept new habits and routines and this takes time. I know I have a long way to go – there is still far too much sugar in our house! Start with one area at a time. Maybe begin by changing the drinks you consume or the snacks you eat every day. Try to start eating more fruit and vegetables each day. Try to start moving more each day. This doesn’t have to be “exercise” in a gym, but just walking more, stretching, taking the stairs instead of the lift/escalator, playing with the kids. If you smoke, try to give up and also watch your alcohol intake. In our modern world battling the demons of sugar, fat, processed foods and over eating is really tough. Just remember you don’t need to be perfect but just start making consistent changes and try to get the whole family on board with you. 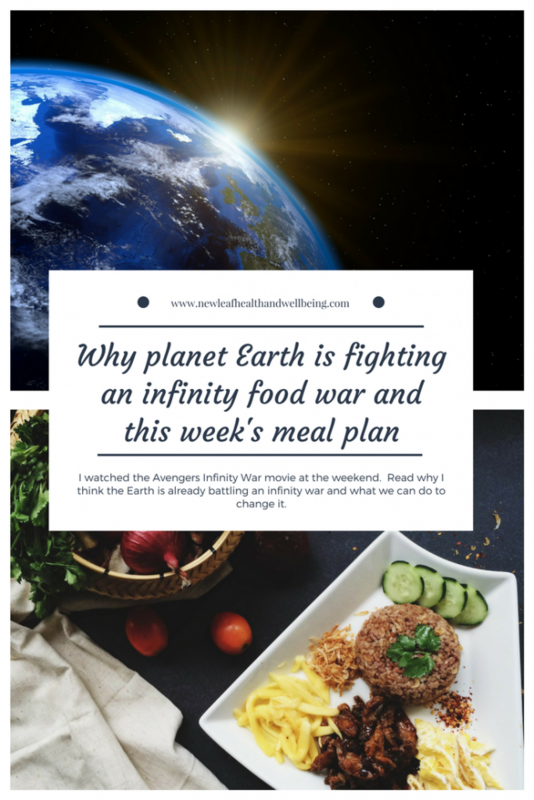 Together we can beat the infinity food war! Let me know in the comments or on the New Leaf Facebook page whether you feel under attack by food and the food industry. Also don’t forget you can sign up for the New Leaf Newsletter to receive regular updates from our blog. I hope you have had a good week. The observant amongst you may have noticed that there was no meal plan last week. My apologies for this. My Reason? – I’ve been working for 2½ weeks on a moderately physical work project. Unfortunately, this work seems to have really aggravated my arthritis and I’ve been feeling pretty poorly. Now, this isn’t a ‘please feel sorry for me’ type of post. The reason I want to share this story with you is because as mothers we often take it upon ourselves to keep ‘soldiering’ on. I think most mothers feel guilty if they aren’t giving 100% to their families. We often fail to provide ourselves with some self-care, because we feel we are too busy. Why should we have time off when there is always so much stuff to get done? But, self-care is really important as it gives our minds and bodies time for recovery and repair. Now, I know some mums are pretty good at pencilling in time out in their diaries for spa days, girls weekends or shopping trips. I don’t know if you are the same, but I find it really hard to totally relax on these sort of trips – I can’t stop worrying whether X or Y child has done their homework, has their games kit etc. Then there’s all the preparations before you go, which can just add to your levels of stress and tiredness. So, over the years I’ve slowly been building up little pockets of self-care in my daily routine. These encompass the usual things of trying to eat healthily for 80% of the time, getting some exercise in (mainly walking and yoga) and trying to get as much sleep as I can!. But sometimes, when I hit particularly busy times, feel unwell or overly stressed, these routines aren’t enough. When we hit the wall, it’s important to listen to our bodies and make big adjustments to our routine and just REST. Try to get enough sleep and generally rest. Having a duvet day with the kids and watching movies does you good and the kids will love having your undivided attention. Have a break from social media – sorry that’s why there was no meal plan last week! Ask for help from friends and family. Being a martyr doesn’t help you to recover and in the long term it can jeopardise your overall health. Have a bit of quiet time – a long, hot bubbly bath is a good spot for this. Have takeaway or simple meals and don’t feel guilty about it. Listen to your body and don’t do exercise if you really don’t feel up to it. Again, your body will gain far greater benefit from resting than being stressed from over working. Most importantly, when you are in need of rest and recuperation, don’t get bogged down by thoughts that your energy levels won’t return – they will, but only if you give yourself some self-care. The cliché quotes of “how can you fill other’s cup if your cup is empty” and “put your oxygen mask on first, before helping others” are true. By looking after yourself you can truly be there for your family when they need you the most. I hope you all have a super Easter Break. Don’t forget to make time for some self-care this week. Let me know on the New Leaf facebook page what self-care habits you incorporate in your daily routine. If you want to keep up to date with the New Leaf blog posts, receive tips and ideas to keep healthy and get free recipes, sign up for the New Leaf Newsletter here.